Late last month, Judge Gordon Quist of the Federal District Court in the Western District of Michigan rejected arguments from the Michigan Attorney General's office regarding a long-running trademark dispute over the M-22 trademark held by M22, a company based in northern Michigan. At issue here is that the company's logo is the same as a Michigan highway logo. There are a few interesting points to this case before one even gets to the question of the trademark. First, M22 is claiming victory although, from what I can tell, the decision by Judge Quist merely determines that this case needs to be heard in state court and not federal court. I won't bore anyone with the reasons why he came to this conclusion, although I do think that given the facts of the case it is the correct one. Perhaps M22 is claiming victory because they believe they have a better shot in state court than in federal. Second, it seems that the state is attempting to cancel registration of the federal trademark through the Trademark Trial and Appeal Board (TTAB). TTAB is a body within the U.S. Patent and Trademark Office (PTO) that determines disputes about trademark registration. That seems a better ground for me than the federal courts for invalidating the mark since, as Judge Quist notes, there's no evidence that M22 is threatening to sue the state over the trademark. Rather, the state thinks that the mark is presumptively invalid. The arguments as to why are a bit trickier. NPR had a story last fall about this case. At that time, Attorney General Bill Schuette argued that the design of the highway logo was a public domain element that shouldn't be allowed to be trademarked. A recent article in the Traverse City Record-Eagle goes more deeply into this point. Language in the federal highway manual seems to suggest that the materials can't be the subject of intellectual property protections by private parties. The question is whether that manual actually has any bearing on trademark law. I am not an expert on TTAB procedure, but as a personal matter I think it bizarre that a company should be able to trademark a logo promulgated by the government. Trademark law is inherently designed to help consumers understand the source of products through logos, slogans, and other source signifiers. The company argues as such, saying that it wants to make sure that knockoffs aren't proliferating in the market. But the ultimate source of the M22 logo — which the company has adopted with minor, if any, changes — is the government. And when you consider that we all as citizens are in control of the government, it seems odd to allow a private entity to exploit a part of it against other citizens and entities. Some experts have noted that given that the mark is purely functional, the PTO should have never allowed its registration. I agree with that argument as well, given that any grant of a mark would prevent the use of road signs by the state or other parties for a functional purpose. As a final matter, I would also note that M22 is inconsistent (at best) in its understanding of why it has the trademark in the first place. In the NPR piece, one of the founders notes that the company doesn't own the logo, and that they aren't interested in aggressively asserting trademark infringement: "Anyone can do anything they want with it as long as it doesn't confuse our customers." He said that the company wouldn't go after a towing company, although they did argue that a wine label reading "M-119" from a different store was competing with the M-22 mark. Trademarks are delicate pieces of intellectual property — their strength depends on how vigorously the holder enforces it. By neglecting to fight potential infringement claims, the mark weakens. Thus, the claim that they wouldn't go after party stores or towing companies is self-defeating — such inaction would weaken their claim to the mark. And indeed, the pursuit of the M-119 wine label demonstrates M22's real enforcement strategy: aggressively assert its mark against any possible confusion, rather than the "live and let live" mantra espoused by its owner. I'll be curious to see how this saga unfolds. It's my belief that government symbols should remain the under the control of the public rather than private citizens or companies; trademarking a highway logo goes against what the law and common sense sets forth. Whether and how the mark is invalidated remains to be seen, although I do hope that either the state courts or TTAB agree with me. This is really great. You capture my feelings about the matter, but express them much more eloquently. I had M22, M119, and M52 signs made to sell in my store. The M22 store found out and phoned me to tell me I was impinging on their copyright of the M22 sign. 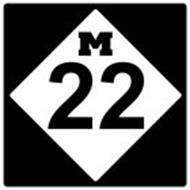 my response to the phone call: "no one owns the copyright or rights to use the M22 sign...so you can't demand I stop using it." I never heard from them again. I am very happy to hear that. Thanks for sharing. This is trademark bullying. Had these guys done something unique to the sign to make it their own more power to them. If they want to sell it more power to them, however this is trademark bullying. This is akin to me trademarking the outline of Lake Michigan and then sending ceaes adn desist letters to every Northern Michigan mom and pop souvenir store threatening to sue them. I'm pleased to see Zazzle, Amazon, and many other sites listing these shirts for sale not being sold by the M-22 company. I was actually getting ready to purchase one and will make sure my money does not go to them. I hope others continue to infgringe on this unjust trademark. What gives these guys the right to use something that belongs to every Michigan resident? If anyone has rights to it its the state or the graphic designer who created it.